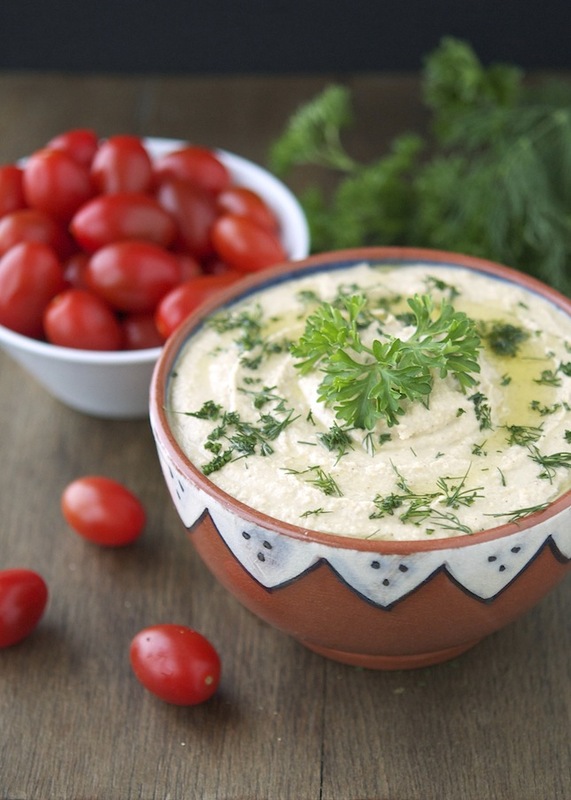 I love hummus for a number of reasons: It’s healthy, low calorie, has a great nutritional value and it's yummy. And for some reason, it's always the right time for hummus. I love to dunk veggies into a smear of hummus. And I also like it to use as spread in sandwiches. Have you ever tried hummus+oven roasted turkey+tomato+spinach sandwich? Hell yeah! Grocery stores are packed with several different brands of hummus but, let’s face it, there’s nothing quite like making your own. Over the years I’ve tried hundreds of different recipes. Even though the ingredients used to make this Middle-Eastern spread are always the same, different processes yield different results. It starts from the chickpeas you choose and how you cook them. Then there's the tahini (i.e., sesame paste). Using cooking water or not? How much salt? Smooth or chunky? You get it, right? I can go on for hours and never reach a conclusion. Anyway, the recipe you'll find here is a combination of the hundreds of recipes (and tips) I’ve collected over the years. First of all, let’s stress out the importance of using dried organic chickpeas instead of canned ones. I know, soaking and cooking dried chickpeas it's a hassle, but there’s no shortcut to greatness. No one can argue with that. Also, the sesame seed paste (i.e., tahini) must be of absolutely top quality. Don’t cheap out on that. An extra $ makes a big difference. Don’t be scared, it can get messy. Especially if you go overboard like me; but isn’t this the funny thing of cooking? This is solid hummus. Fact. Herbed Hummus Print this Recipe! Rinse the soaked chickpeas well and drain them before putting them in a saucepan, with ¼ teaspoon of salt and the baking soda. Cover them with water, bring to a boil, cover and cook over medium heat about 1 hour or until the chickpeas are very soft. If necessary add more water. Keep in mind that the baking soda will speed up the cooking process so be careful to check before the chickpeas turn into puree. Once cooked, drain the chickpeas, reserving the cooking liquid. Crush the garlic until pureed. Transfer it to bowl of a food processor, add the sesame seed paste and lemon juice and process until white. Add ½ cup of cooking water, ¼ teaspoon of salt, some black pepper and process until completely smooth. Add the chickpeas to the sesame paste mixture and process until very smooth. Depending on how you like your hummus you can add further cooking water. Adjust with salt and pepper to your liking. Stir in fresh herbs and serve drizzled with olive oil. I love hummus and this one looks super yummy! Would it be okay to use canned chickpeas? If so, how many should I use? I have some cans that I don't know what to do with. Man, I LOVE that bowl! I need to be on the lookout for one just like that. And now you're having me long for hummus. Sigh. Maybe I oughta stop reading your blog... NOT! No way Jose, not in a million years! Another cool recipe of hummus. Appreciate this too much. Hmm I love hummus! I eat it with carrots, tomato, ... thanks for the recipe! if you make too much can you freeze it? Yes, you can absolutely freeze hummus. 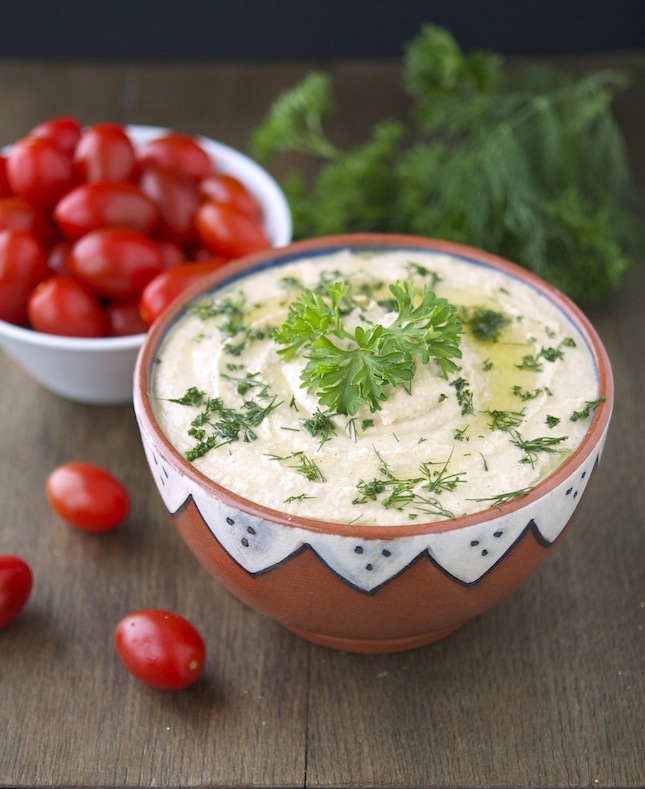 Freeze humus in an airtight, freezer safe container. Don't fill it all the way to the top because it will expand as it freezes. When you are ready to eat it, simply thaw in the refrigerator the day before you want to use it. When you remove the lid, you may notice some liquid at the top. This is completely normal, just give it a good stir and it should be ready to eat immediately!